The whiteboard has long been a great tool for brainstorming and presenting ideas. But its inability to transfer and integrate its ideas and contents onto our work devices limited its greatness. That’s been slowly changing now with the introduction of digital whiteboards like the Microsoft Surface Hub and now Google Jamboard. Google Jamboard is a cloud-based digital whiteboard designed specifically for people who work in a collaborative environment. It runs Google’s G Suite ‘s services offering access to Google Docs, Sheets, Slides, and Photos as well as integrating with Google Drive. Jamboard runs a custom OS built on top of the Android 6.0 Marshmallow OS. The Jamboard hardware comprises a 55-inch, 4K monitor, with a wide angle 1080P webcam. On the rear and right side of the monitor are the HDMI 2.0, USB Type C, USB 3.0, ports, an audio connector, and an Ethernet input. Also included in the package are 2 passive stylus devices and a whiteboard eraser. On the left side of the device is the power button, a source input, and volume buttons. To start a collaborative whiteboard session or Jam, users connect directly with the device or use companion apps to do it. While operating the Jamboard, users can make use of the stylus to sketch, draw or write on the board. But using the fingers, other stylus devices or soft objects should work fine as well. Using the Jamboard is also a simple streamlined process. Anyone who has a G Suite account can click on the screen and start a session right away. They can then invite other G Suite account holders to join in the session. The companion apps themselves are highly useful allowing users to make edits, place markings, and participate remotely via Google Hangout. Users who don’t have the companion apps on their smartphones can participation in a View-Only mode via a web link. Jamboard allows users to access third party web content but does not currently allow using more than 1 application simultaneously. So if a couple of apps are open and one user wanted to place a marker on, say Google Maps but another user was already making notes on the screen on another app, the first user will have to wait until the other person finishes the task before setting the markings. One cool feature that users will appreciate with the Jamboard is the Handwriting Brush feature, which basically converts illegible, messy text into perfectly readable blocks of text with great fonts. The effect is instantaneous and great to look at, as you probably noticed in the demo. Here’s a YouTube video introducing the Jamboard. The Jamboard will cost around $6000 without the stand and will be available in the first half of 2017. 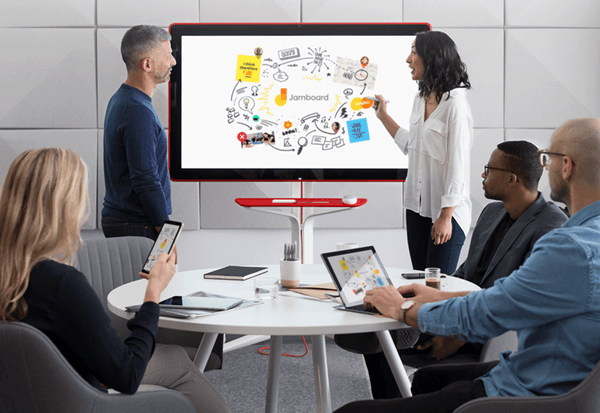 It does look quite exciting and with Google promoting developers to create apps for the Jamboard, it looks like the Jamboard is out to shake the monopoly of the Microsoft surface Hub and make business collaboration and conferencing a whole lot fun and useful! Visit the official website to learn more about the device. Link below.